We all are so focused and determined towards our professional goals that we, sometimes, over look the importance of getting a break from our responsibilities. The best way to relieve your tensions is to go visit a foreign country in which you can get a chance to see new, exciting and beautiful places and meet new people at the same time. The best way to explore a country is by going for bus tours because this is the only way by which you get the experience of sight seeing most of the places of a country. There are various bus tours available for all kinds of tourists so they can get the best out of their experience. However, the buses in which tourists like to travel are Double Decker because they like to travel in bigger groups. The reason why double decker is given this name is because it has two storeys or decks. These buses are specially known for the short sight seeing tours. Double deckers are popular in some cities of Europe and mostly used in former British Colonies such as Honk Kong and Singapore. But with the passage of time, they became popular among all the countries around the world. 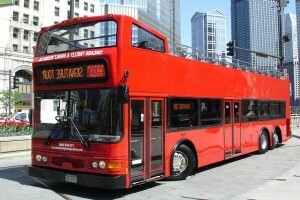 A typical Double Decker has the capacity to accommodate 60 to 70 people due to which bus tours become even more fun. Usually the upper compartment of the bus is roofless so that you get the feeling that there is nothing between you and the beautiful places that you see while enjoying the weather. Besides that you can get a clear view of all the buildings and places from the upper deck of the bus. Considering this reason, the buses are manufactured in such a way that they can hold up to 45 people in the upper compartment. The number of seats on the upper and lower deck can vary depending on the size and the structure of the bus. If you are a person who likes to enjoy travelling in a peaceful environment then there is always an option for you to travel in the lover compartment where there is less noise. In most of the double deckers, there are 14 seats available in the lower compartment. All the double deckers are not roofless. There are also such double deckers that are completely occupied just like an ordinary bus. The choice is solely made by the tourist whether he or she wants to travel in a roofless double decker or one with the roof. The prices of tickets are charged according to the distance you travel. Usually tickets for children are available at a cheaper price. A normal double decker ticket would cost an adult about 35 dollars for an entire day. The same ticket can be purchased for 18 dollars for a child. There are different packages for families you can choose from. The best thing about double deckers is that these spacious buses are not only used for travel tours. Many people book double deckers for parties, weddings, prom, concerts, and birthdays in short any kind of get together that includes a big crowd. Renting a double decker is a very sensible option since you would not have to pay for the tickets over and over and if you are lucky enough, you can get some really good deals. It would not be right to say that double deckers are only used for bus tours. Many companies are using double deckers for advertising their products because they are well aware of the fact that many people prefer to travel via double deckers. This way they get the opportunity to market their products to a major portion of their target audience.